Outrageous comedy music at its best! 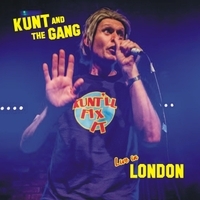 No subject is too taboo for Kunt and the Gang in this definitive live performance from their Kunt'll Fix It tour. This is the live recording of the final sell-out night of Kunt and the Gang's 2015 Kunt'll Fix It tour. Like Derek and Clive meets Ivor Biggun, no subject is too taboo as Kunt wades through his back catalogue of cringey earworms!